Council will be upgrading the Upfield Path in early October. A 200 metre section between Albion and Tinning Streets will be closed – users will not be able to use the area for the duration of the works. 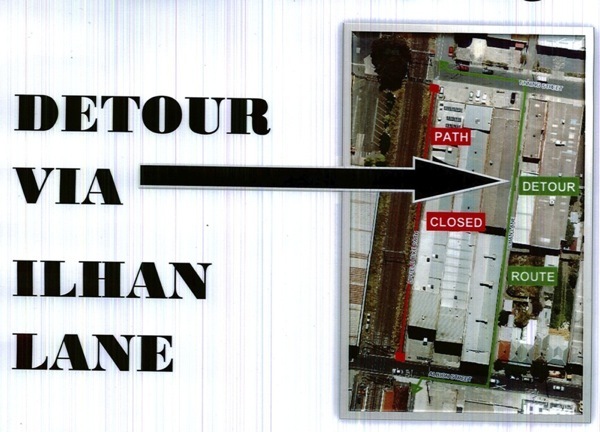 There is a detour some 40 metres to the east via Ilhan Lane. The linked image shows a map of the detour. Works are scheduled to start on 7 October and continue for around 5 weeks (weather permitting). Building a retaining wall to stabilise the embankment. Using asphalt-coloured concrete for stability and longevity. Lighting is part of the project but has been installed already (May 2013). Cost of works – $200,000 approx. Moreland Council contact: Nicholas Elliot, Transport Projects Officer, 9240 1294. I’m pretty excited by these works. It has been 3 to 4 years in the planning – there have been a number of hold ups due to difficulties of working in a rail reserve. The path has a steep approach down to Albion Street which is difficult, even frightening for inexperienced users, and for the parents of young children. This slope will be much reduced and so manageable by all cyclists and pedestrians. The works will stabilise the embankment which has gradually been slipping away, causing holes in the fencing – another unsettling experience for novice cyclists. The new lighting has already given a dark area a much needed boost and Council has received some compliments on the new ‘look’ and that the lights are low energy LEDs. Together with a new smooth, wider, fully fenced path, the area will receive a welcome urban make-over.